In the few days of writing this article, the political, social and cultural contexts embedded in the words ahead changed faster than my fingers could type. As protests go, the student-led Occupy Central’s ‘Umbrella Movement’ in Hong Kong has become a defining historical moment in China’s history, the biggest pro-democracy protest second to the Tiananmen Square of 1989. It has taken hold of the world’s (social) media since 28 September 2014, unfailing in its strength and diverse voice, developing more unpredictably and faster than China’s city skylines, giving a potential new power to the people through what I’m questioning as a new global discourse – China’s contemporary “agitprop” culture. Image courtesy of TIME magazine. 13 October 2014. “Agitprop”, a portmanteau word of “agitation” and “propaganda”, was initially coined during the 1917 Russian Revolution, central to the governmental committees of the Communist Party of the Soviet Union, applied to the campaign of cultural and political propaganda materials produced. The “agitation” (speech) and “propaganda” (literature, theatre, drama, music and art) did not bear any negative connotation at that time. It was seen as the positive “dissemination of ideas” and very simply favoured Communism, being used to influence public opinion whilst achieving political goals. The term made its way to the West (Europe and the USA) from the 1920’s onwards as part of then key political uprisings, and due to the rise of “agitprop theatre”, which held a similar definition. It then became propaganda for and from the people, rather than from governmental hands. In Chinese, “agitprop” translates to 煽动与宣传 (shāndòng yǔ xuānchuán) – “incitement” (to move to action, to provoke, to urge) and “propaganda”. Similar to the Soviet Union, it was initially used without negative connotation, however was applied to propaganda materials produced by Mao Zedong during the Cultural Revolution in turn, embedded in a partially ironic way into the Chinese art historical movements of ‘Political Pop’ and ‘Socialist Realism’. In this respect, today, it has been difficult to view socio-politically grounded cultural practice from China without a negative bias connected to Communism, Capitalism, governmental censorship and political power plays, however, I suggest the art appropriates the ‘Umbrella Movement’, challenging these historical preconceptions. Here, “agitprop” culture is critically illustrated alongside what I’ve called political observations of the city, of Hong Kong. The umbrella became the symbol of the Hong Kong protests after they were used on 28 September 2014 by protesters to protect themselves against pepper spray and tear gas. Since then, it has become the global icon of pro-democracy in the Chinese nation, a semiotic symbol of political protest. 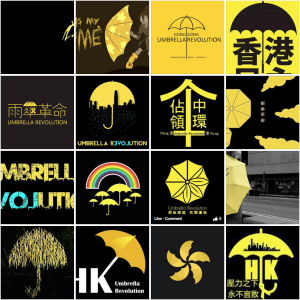 Screenshot from Kacey Wong’s Facebook Album ‘Umbrella Movement Logo Competition’, a constantly updated online folder of designs and images, open source for ‘everyone to use in the next revolution’. The top three prizes are JUSTICE, DEOMCRACY and FREEDOM. References to umbrellas used in relation to protests can be seen over recent years including on 3 June 2009 when government officials and police officers in Beijing were seen to block CNN reporters from filming near, or of, Tiananmen Square on the eve of the twentieth Anniversary since the Tiananmen Square protests. Here, the umbrella was used as a tool of privacy and protection, censorship and control by the Chinese government. Another example is from January 2010, when the Zhengyang Art District in Beijing was threatened with being demolished due to an “urban redevelopment program”. In response to this, artist Xiao Ge organised the art project ‘Warm Winter’ to raise awareness of the issue, bringing together over twenty art centres and hundreds of artists in the Chaoyang District. Interventions were organised in the form of exhibitions, performances and seminars all showing the artists’ resolution to fight the eviction, where acclaimed Beijing artist Huang Rui, founder of the historic 1979 Stars Group who were fundamental in developing a contemporary Chinese art discourse and founder of the 798 Artistic District, performed ‘拆那(demolition)/China’ (2010). Wearing a Taoist costume, a black and white robe bearing the words “China” and “拆那Chai Na” (homophonic of the English word) meaning “that demolition”, was to be understood as ‘Where is the demolition?”, Huang stood in the freezing minus ten degree Beijing cold for more than an hour, motionless, positioned on a painted black and white Ying-Yang symbol holding an umbrella. The umbrella was taken from his on-going ‘I-Ching’ performance series that explores China’s relationship to the West and the difficulties of cultural translation. It is directly based on the ancient Chinese book of divination of the same name, created in the Zhou Dynasty that contains 64 hexagrams signifying the relationship between human life and the natural world, used to predict the future. Huang produced 64 handmade black and white umbrellas, each adorned with an I-Ching Chinese character and its English translation, inviting volunteers to wear black and white and hold one of the umbrellas for the entire 64-minute performance. Following Huang’s cue, as he stands firm on the black and white Ying-Yang symbol, he speaks to each umbrella carrier for 64 seconds and tells participants when they can communicate with each other, aloud or in silence. When the performance had finished, each participant received an umbrella to take home. ‘拆那(demolition)/China’ (2010) by Huang Rui. Image courtesy of the artist. In the instance of ‘拆那(demolition)/China’ (2010), the umbrella became a statement symbol, a protected space for dialogue, an invitation to stop and engage with the political situation in hand, frozen in a moment of threat and unknown social change. It was act against society, a performance by and for the artist community, not to be seen as propaganda for the people. Whereas for the ‘I-Ching’ performance series, the umbrella becomes a space for intimate exchange, a forced yet spiritual engagement with the individual, a dedicated time for the understanding of the other, open to new translations and mistranslations. In relation to Occupy Central’s ‘Umbrella Movement’, the umbrella encompasses all of these prefixes and goes far beyond. In the two weeks since the protests started, sculptural umbrella interventions have been interrupting Hong Kong’s streets. This includes ‘Umbrella Man’ by 22-year old Hong Kong graduate known only as MILK. A twelve-foot high human figure made of wood that tells his and the people’s story of the protest. 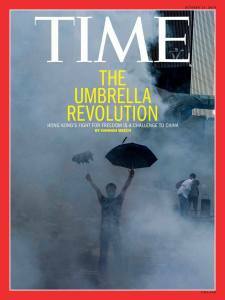 Umbrella Man’s face is painted white representing all activists who were tear-gassed and pepper-sprayed by the police, standing tall and strong for the people, brandishing the iconic yellow umbrella. It has been adopted by the movement as a symbol of freedom and peace, becoming an icon within which the protesters can see themselves, whilst standing as a manifestation of the artist’s spirit. 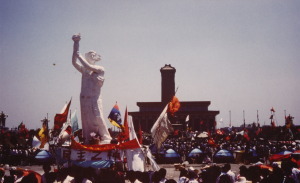 This piece has been referenced by the media to the ‘Goddess of Democracy’, the thirty-three foot papier-mâché torch-bearing female figure constructed during the Tiananmen Square protests of 1989, a context unaware to MILK perhaps due to his age, coming from the next generation born in 1992. In the Causeway Bay occupation site, umbrellas take charge of the street, coming together en-masse as a pop-up exhibit, collectively representing the pepper spray incident, where again the yellow umbrella is a key icon. Although, these works are contextually laced with the political connotations of the situation at hand, they are, in my view, only surface level comments. They are an immediate reaction to the moment that can only achieve a certain level of engagement and exchange with the people and audiences. More critically engaged works are provided by the interactive, online media and public intervention art project ‘Stand By You: ‘ADD OIL’ Machine for HK Occupiers’ (www.occupier.hk/standbyyou). Created by a group of art school graduates, it wanted to keep a direct focus on the messages and work of the protesters. Using borrowed computers and projectors, they created an online platform for people from all over the world to leave messages of support. The website has been repeatedly hacked, then reclaimed by the students, where in the interim of the site being down, they collected messages via their Facebook page (www.facebook.com/standbyyouoc) until it was back online. 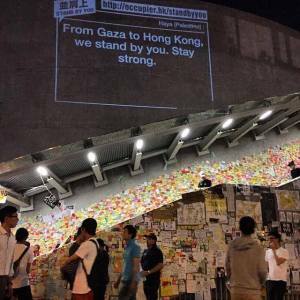 Collated messages are projected on the wall of the government headquarters in Hong Kong every evening, positioned in parallel to a message-writing ‘Democracy Wall’ recently coined the “Lennon Wall” referencing the peace protest work of John Lennon. By the 6 October, they had collated over 30,000 messages including from other areas of global conflict, protest and war such as Gaza. This level of exchange and engagement resonates the Hong Kong’s political situation on a local to international platform, reinforcing a sense of global unity, hope and strength for the people. By creating this platform, that will ultimately become an invaluable archive of the event, it helps to build a critical sense and understanding of the relationship to the protest beyond China’s boundaries. Sketches and drawings are another medium that have come to define the ‘Umbrella Revolution’, from illustrations within global newspaper and magazine media, to on location works documenting events as they unfold. 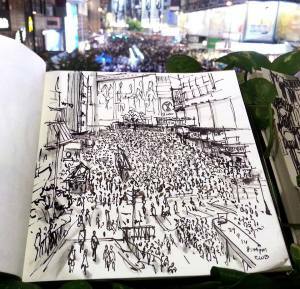 On the 30 September, Urban Sketchers Hong Kong (USHK) (established in April 2013, as part of the global Urban Sketchers network) initiated the online group ‘Sketching Occupy Central’ (https://www.facebook.com/sketchoccupycentral) where members upload and post their images. They see their work as a process of city preservation in the fast-paced urbanisation of China, where ‘art plays an important role in all kinds of movements, giving the audience an opportunity to analyse the situation from a different perspective’, a now global audience. These drawings differ from the photographs of Lam Yik Fei as they involve an extended artistic engagement, described by members of the Urban Sketchers Hong Kong as a kind of “meditation” in the wake of such unrest. 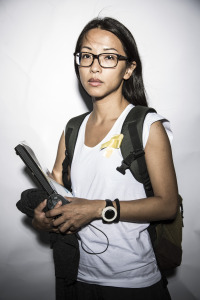 This intimate digital diary approach provided by the Hong Kong sketching and drawing communities becomes more precious than most general photographs of the protests that have been taken en masse in Hong Kong, flooding online and in-print media streams as if like running water. Furthermore, this over-saturation of photographs shared through global media sources due to the use of mobile phone cameras, social media and the Internet, has the ability to dilute and somewhat glamourize the political situation and position of the people. The more familiarity, the less shock-value. It becomes, well, “normal” or expected. Conversely, the photographs are invaluable in documenting the protests building a necessary visual socio-political historical legacy. As media, photography and drawing both ultimately achieve the same conclusion – they document the political observations of the city as it happens, the human condition and the human connection. Barely touched upon in this article is the voice and response of Mainland China to the ‘Umbrella Movement’. 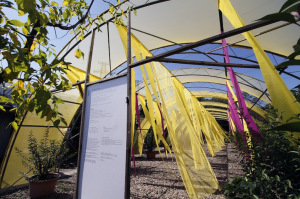 To my knowledge, there have only been two key cultural projects that have taken place, both in the Beijing area – ‘Wishing Knots’ (2014) by Ye Yun and Nozomi Kanemitsu as part of Beijing Design Week 2014 (as shown above), and a poster exhibition and poetry reading in the Songzhuan Artist Village. To date, over thirty-three artists and writers in Mainland China have been detained for showing support. Social media platforms including Weixin (WeChat) and Instagram, have been censored in Mainland China and Hong Kong. This has not deterred people, rather encouraged them to use other digital online communication and social media platforms such as Facebook, which is not censored in Hong Kong, and to create new ones such as the ‘Stand By You’ project. It has reinforced an importance and need for fluid global networks of communication, especially to create dialogue and exchange with other areas of global conflict, protest and war, and also the need to archive, to create a socio-political historical legacy for future generations. 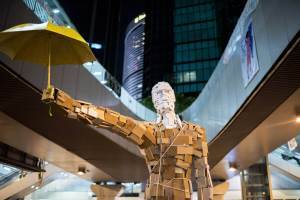 As more pop-up city street public intervention art projects appear in Hong Kong, it feels like there is a clear sense of urgency in the ‘Umbrella Movement’ artistic practice, where it is more about impact rather than contemplation. In the coming months and years, it will be interesting to see how artists continue to respond to the event after having time for reflection and the conceptualisation of ideas. Hong Kong is a hybrid city, ruled by an authoritarian China yet created on democratic ideals. As the government continues to cancel meetings with the students, it seems that the voice of the people is getting louder and more established. When interviewed online or by telephone, most artists examined here stated that their work was a documentary, an observation, not propaganda yet politically grounded – documentation of Hong Kong’s fast-pace of change, its architectures of change and socio-political change. However, I see them as observations and also as part of a developing cultural discourse, that of contemporary “agitprop”, fundamental to Chinese contemporary culture. “Agitprop”, in my view, is now a multi-dimensional term, redefined in a new global transcultural specificity that has changed its meaning to have a positive effect. The word’s previous historical contexts and negative connotations need to be renegotiated and redefined in the new political, social and cultural parameters. It is the appropriation of a political event. It is a transcultural ecology specific to place. It is socialist realism of the 21st Century. It is to challenge and provoke. It is art and culture from, and of, the people. It is “citizen as activist”. It is the next generation. It is the human condition and the human connection. It is an on-going dialogue. It is a (online) global community, network and voice. It is a series of hashtags: #occupycentral, #hongkongprotests, #democracynow, #umbrellarevolution, #umbrellamovement, #occupyhk, #occupyhongkong, #hongkongdemocracy.